Let k be a circle in the xy-plane with center on the y-axis and passing through points A(0, a) and B(0, b) with 0 < a < b. Let P be any other point on the circle, Q the intersection of the line through A and P with the x-axis, and let O(0, 0) denote the origin. Prove that ∠BQP = ∠BOP. The problem admits a 1-step solution if we observe that the angles BQP and BOP have same end points and if they are indeed equal the four points B, O, P, Q must be concyclic. 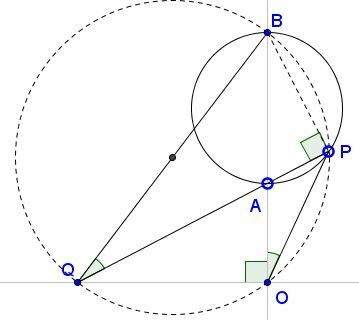 But the points O, B, Q form a right triangle whose circumscribed circle has BQ as a diameter. ∠BPQ is subtended by that diameter and should therefore be right. But it is in fact right because it is subtended by the diameter AB in circle k.
Thus the solution is this. Angles BOQ and BPQ (= ∠BPA) are right, making the four points B, O, P, Q concyclic. The two angles BQP and BOP are inscribed into the circumcircle of BQOP and are subtended by the same arc BP, therefore ∠BQP = ∠BOP.